2017 Million Dollar Case Study Recap (So Far) + EXCITING ANNOUNCEMENT! Wow time flies by! For Amazon sellers, the days are long, but the years are short. 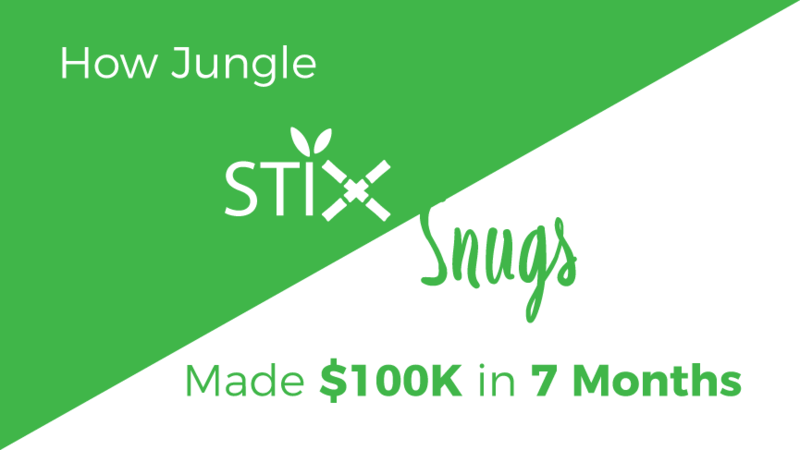 While we’ve been busy sharing the whole process of launching Jungle Snugs with the Million Dollar Case Study, our original private label product, Jungle Stix, has been chugging along nicely. Just in case you missed it all, we’ve been documenting every step of the 20+ sessions so far at this page, and if you haven’t subscribed yet, you can register to join at that page and get a full recap ebook! Overall, 2017 has been a strong year for our products. Playing the role of the unflashy and dependable role player, we’ve been generating steady sales with Jungle Stix. Our most important task there is to ensure that we always have inventory in stock so we don’t get the dreaded “Out Of Inventory” on our listing, which can torpedo our Best Seller Rank and sales. Meanwhile, our latest launch Jungle Snugs has been successful and seen the growth in revenue and consistently reached the targets that we set out to achieve. We managed to get the product from conception to launch within around a 16 week period and have been ramping up the sales ever since. So as we are now past the mid year hump, let’s take a look at the first half of the year and see how sales for our two private label products have done….using graphs, obviously! This is the combined sales for all products. At the moment, Jungle Stix are at the target of ~22% profit margins. And as we are still in the launch phase of Jungle Snugs, aggressively running Pay Per Click campaigns to get in front of relevant customers, we are just starting to hit the break even point on a day-to-day basis. This effects our overall margins, which are sitting at ~10% for the year to date, which is about $10k. There isn’t really a great way to compare time periods in Seller Central. 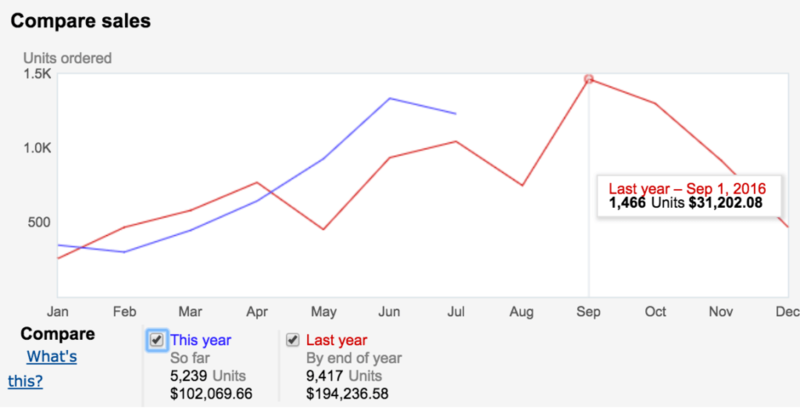 However, in this screenshot, you can see that this year we are outpacing our sales from last year, in the same time period. This is to be expected as we have more SKUs available for sale, and we have an established product already with Jungle Stix, which is one of the top organic results for our main keywords. Moreover, as we have been selling Jungle Stix for over a year, I have built a strong rapport with our supplier, and come to understand the cadence of our communication and what the lead time required is, from placing the order to having our inventory restocked in Amazon’s warehouses. Regarding Jungle Snugs sales trends, I don’t think that there will be too much seasonality in the baby towels, at least not as I could tell in the Google Trends data. There may be a small bump in 4Q for gift giving, but we will be able to tell with actual data very soon. 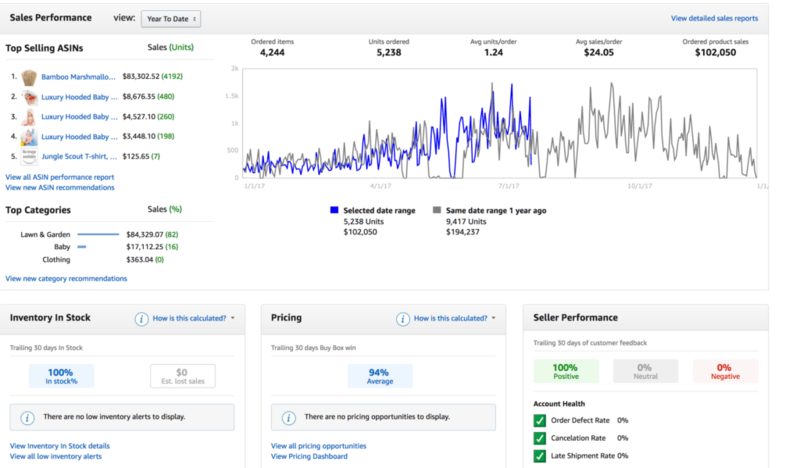 Your true seasonality details will always be reflected once you have sold your product for more than 12 months. When I initially started selling both the marshmallow sticks and baby towels, I planned to set our price point about 20% higher. However, with a public product launch like we are running, I should have expected to have a lot of copy cats, which of course drovve down the price. Economics 101 of supply and demand. We also decided to invest in higher costs of importing via air so that we could get the product live faster than I would normally, importing by ocean freight. We also decided it was more important for the time being to secure our sales velocity and boost our Best Seller Rank, so that Amazon would reward our organic rank. Therefore we were investing heavily in our pay per click campaigns. Over time we can work on our brand and value proposition to position Jungle Snugs as the highest quality baby hooded towel (which is is!) and get further profit out of each sale, all for charity of course. Have you heard? Opportunity is ripe overseas! Don’t look a gift-horse in the mouth, right? When things are good, there’s no need to rock the boat, necessarily. But what about if there are greener pastures abroad? OK, enough with the analogies…. But I have heard anecdotally from my network of many sellers prospering in the Amazon European markets, and there are plenty of opportunities. 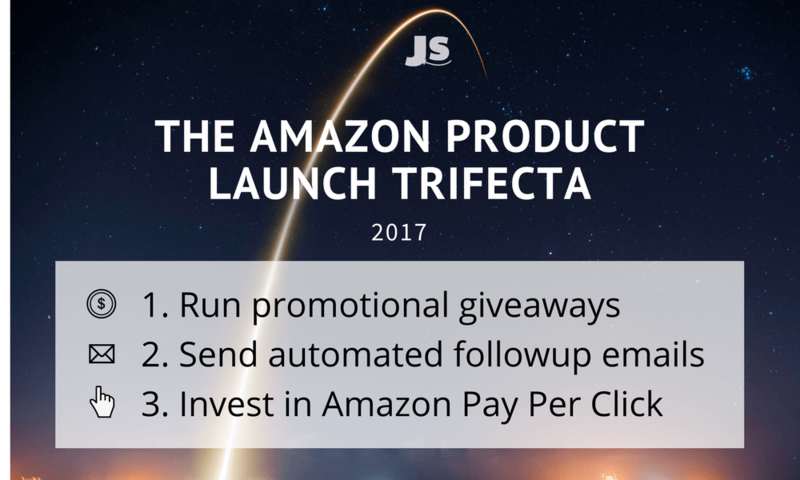 This applies to existing Amazon US sellers looking to expand overseas, and new sellers looking to become Amazon sellers all over the world. There is also a new Pan-European program that allows sellers to ship inventory to one FBA location and get it fulfilled across the whole of Europe, which some eager sellers are already putting to the test. With overseas opportunities out there for the taking, we’re moving on to part two of the Million Dollar Case Study. Starting on August 2nd, I am rebooting the journey of launching a product , this time in Europe! Yup, the Million Dollar Case Study is expanding with a different market, different customer base, new strategies to leverage. It’s going to be an incredible learning experience, and of course all details will be shared right here. This is the first time we’ve covered selling internationally in any of our case studies and it’s going to be awesome. I just want you to cast your mind back to last October when the seller community was in a tizzy–uncertain how the FBA world had shifted with incentivized reviews now banned. Since that time, I have launched about a dozen products, and found the formula that works. So here’s just a little update on the new product launch strategy that works, as we get a lot of questions about this from the community. Yeah, it’s really that simple. If you are selling a good product (read: high demand, low competition, healthy profit margins), it’s a lay up all day! As predicted last year, we’ve all moved on from the changes and adapted to become all-round better sellers. If you want to dig into the details of how this launch strategy was executed with Jungle Snugs, check it out here. Note: there is a ramp up period to get this started, where you will have to invest time and money to get the product where you want it to be. I am still currently in that stage with Jungle Snugs, having invested in the product cost of the units we gave away at a discount, and also our Pay Per Click campaigns. The result is that we are now ranking in the top 10 for our main keywords. We have Headline Ads running (via Amazon Marketing Services), and Sponsored Product ads running (via Seller Central’s ad platform). So if a visitor searches for a wide swath of relevant search terms, our product will show up. And this traffic converts well! Here is a look at our overall Advertising Report for all our products for the past month. We still need to adjust our bids for the Jungle Snugs campaigns in order to decrease the ACoS, however, that is a process that can take months to really fine tune. Our target ACoS is similar to the Jungle Stix campaigns at <35%. 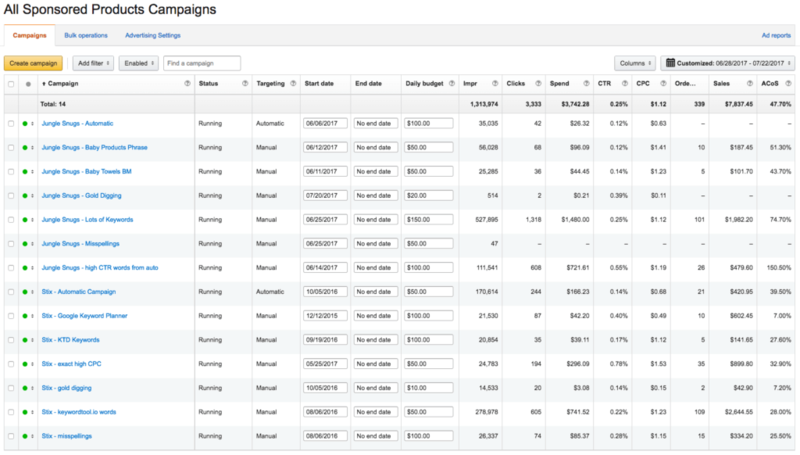 We will continue to work on these campaigns to ensure we have continued traffic and sales, and improved ROI over time. This comes as no real surprise, but the fundamentals are never earth-shattering news: the key to success as an Amazon seller is finding the right product. Conducting data-driven product research to uncover those ripe Amazon opportunities. If you have not yet found a product that think has potential, keep at it… there are a ton of opportunities. It just takes some time and effort to uncover. There are no shortcuts or secrets there. I highly recommend taking a look back to the Million Dollar Case Study Session 1 and Session 2 to see exactly how I find these product opportunities. I hope you can do the same and launch your own path to financial freedom! So how can we accelerate the growth of our sales and donations for Pencils of Promise? Well we will continue to work on our existing products, but our #1 priority: I am going to focus on launching a product in Europe. This means we can tap into new opportunities with a new item in a different part of the world. This will even allow us to send inventory to one location and have Amazon fulfill across the entire continent. Europe is a conglomerate of unique marketplaces, so it isn’t as easy as just deciding to sell marshmallow sticks or baby towels in Europe. We will go through the product research from scratch, to find the right product to launch in these marketplaces. So this will be a fantastic opportunity to join and follow each step of the journey. Bear in mind that you don’t need to be from anywhere in particular for this case study to be relevant and useful to you. Whether you are a brand new seller, an existing U.S. seller or based in Europe already, this case study will cover all bases!